GAMER'S INTUITION - Game reviews - Flock! Flock! 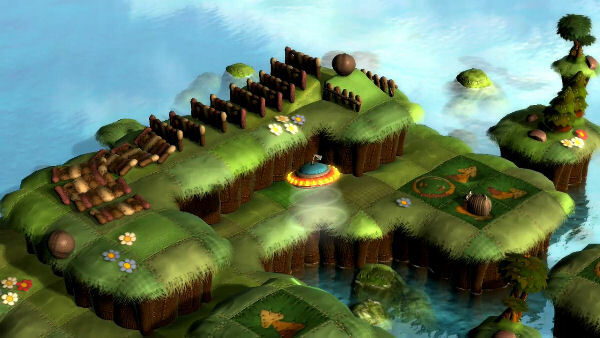 was one of the many titles we got to see at E3 2008, and one that seemed cute, strange and the kind that could grab you for hours. Flock! 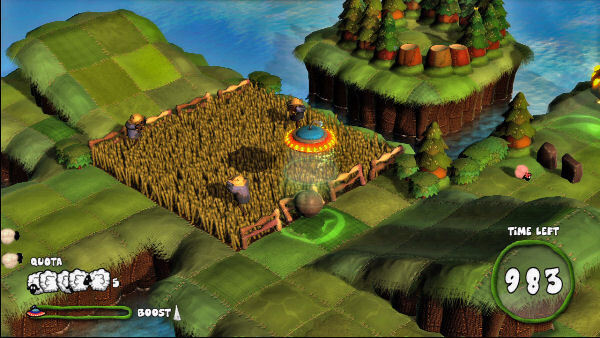 has now landed on Xbox Live Arcade and is invading gamers' homes everywhere with its hordes of sheep, pigs, chickens and cows. Flock! 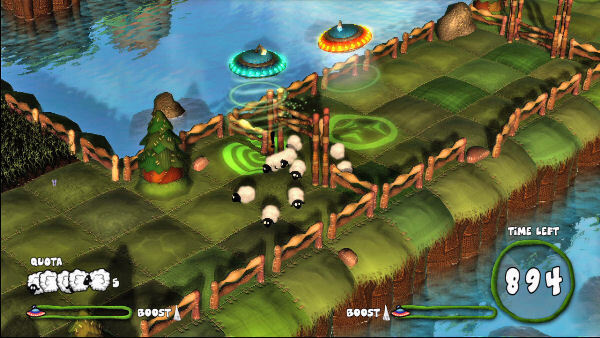 is a cute little game for XBLA, PSN and PC where you control a UFO and attempt to herd sheep and other farm animals into - are you sitting? - the Motherflocker. Animals are afraid of the light emitted by your UFO, so they will run from it. You basically use this to guide (in a pretty clumsy way) the animals to the Motherflocker. 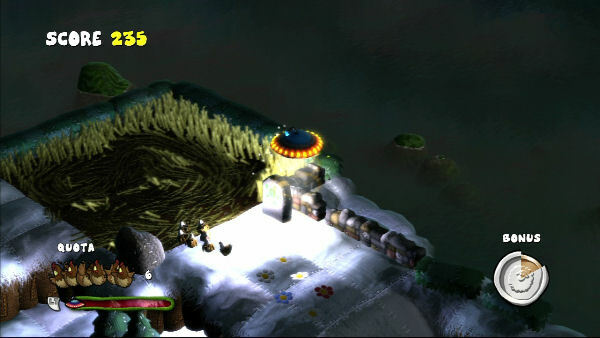 The UFO also has a tractor beam, which you can use to move, push and pull obstacles. 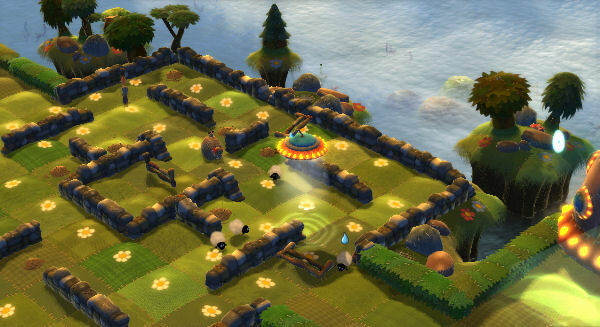 For example, you can knock down fences, pull trees out of the way of the animals, use bales of hay to plug large holes so the animals can walk over them. The UFO is also equipped with a depressor beam, a tool you can use to create crop circles... I mean, to create a path in the crops for the animals to get to the ship. Different animals react differently to obstacles due to their specific species behavior, so you have to use this to your advantage. Chickens can fly for very short distances, so they can overcome certain obstacles. Sheep won't go through fences unless you soak them - they will shrink and squeeze by. Chase the cows for a while and they will go crazy and stampede fences and other obstacles allowing other animals to pass through. As you progress, you are rewarded with useful items that help herding the animals. For example, there is a pink sheep that will make all the other sheep fall in love with it, so they will follow her around everywhere. 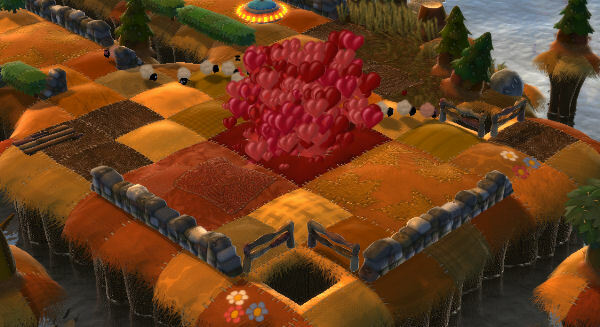 This way, instead of worrying about herding all the sheep, you only need to "control" the pink one. There is a timer for each stage which displays how long you have to achieve a specific goal. The color on the timer changes from gold to silver to bronze as the clock ticks. Depending on how fast you clear the stage, the better the medal and score awarded. The presentation of Flock! is quite cute. The environments resemble a hand-made quilt, where terrain squares seem stitched together, and everything seems to have a soft padded look. 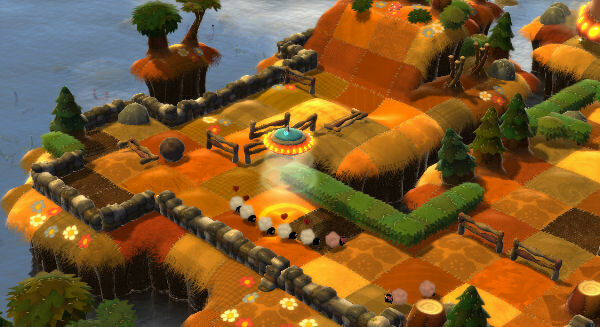 The level designs are interesting and clever, containing plenty of obstacles that make herding a game of patience. For example, scarecrows will scare the animals, scattering them about and sending them running off the edges and right into the water. But even dead animals can be of use, so if you happen to see sheep fall into a pit (quite funny to see a bunch of bones, chops and little sheep angels appear), pick up the lamb chops and use them to distract wolves. 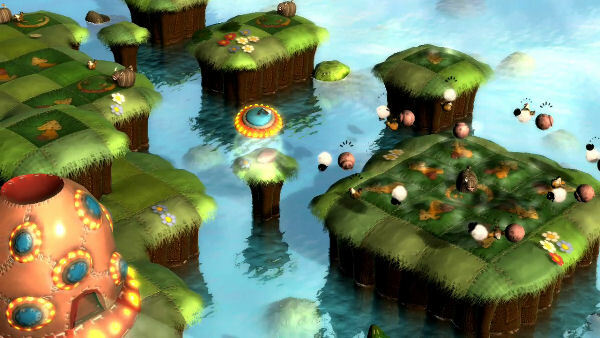 There are over 50 levels in the entire game, but you can zip through them in a few hours, so there isn't much for longevity there. 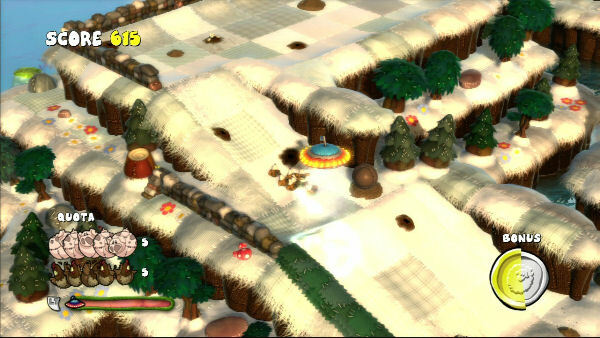 But the game includes a level editor with a map server that lets you share your user-creatd stages online. While Flock! is basically intended as a single-player game, there is also a local two-player co-op mode which isn't all that rewarding and turns out to be very limited as far as maps - especially considering the possibilities of the editor. There is also no online mode, which greatly limits the multiplayer replay value. Overall, Flock! is an interesting game (you can check out a PC demo at the official site), even if at times frustrating and definitely aimed at the most patient gamers. Unfortunately, the longevity, limited multiplayer and price point ($15) will probably scare away most gamers. Special thanks to Jen Chong and Capcom for providing a copy of this title.